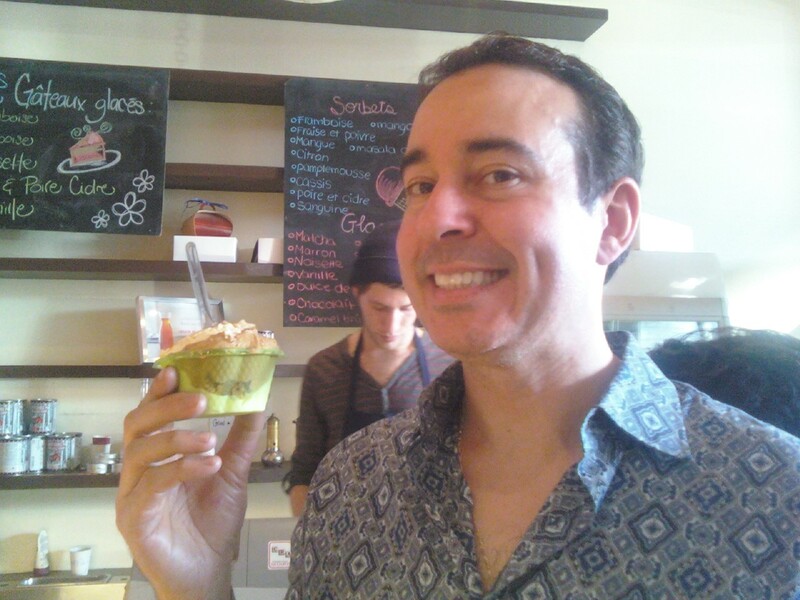 Joseph Mallozzi's Weblog: April 2, 2010: With Great Power…, Chocolate-Chocolate-Chocolate! And Ice Cream! Space Premieres Tonight! April 2, 2010: With Great Power…, Chocolate-Chocolate-Chocolate! And Ice Cream! Space Premieres Tonight! The artist, Trevor Hairsine, is a British comics vet whose past work included stints at 2000 AD and Marvel Comics. 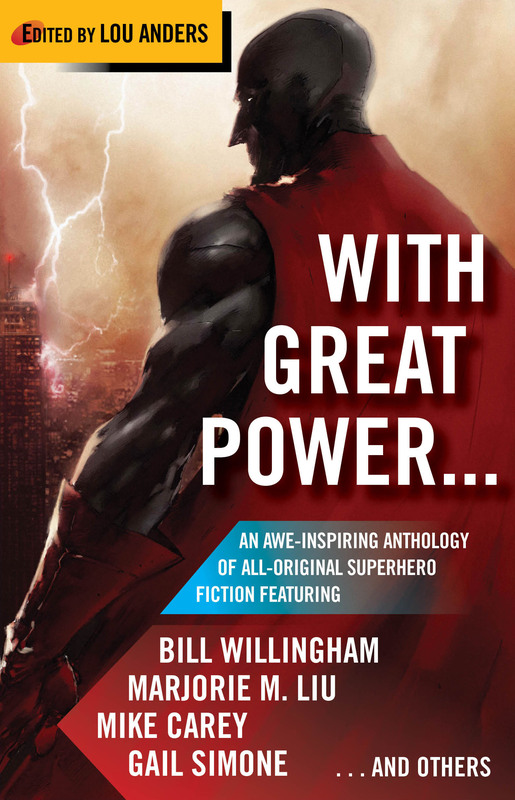 If you’d like to pre-order the book, head on over here: http://www.amazon.com/Great-Power/dp/1439168822. It hits the shelves in July. Well, I’m back in Montreal, enjoying family, home cooking, and intrusive questions about my personal life! 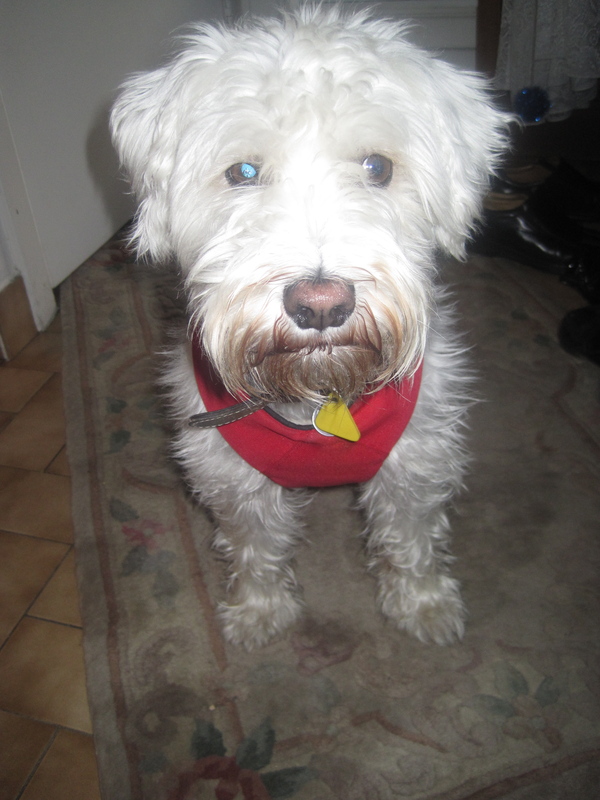 Felix was the first to greet me, barking once as I walked through the door before immediately losing interest and wandering off. Mom and sis cook up a storm. 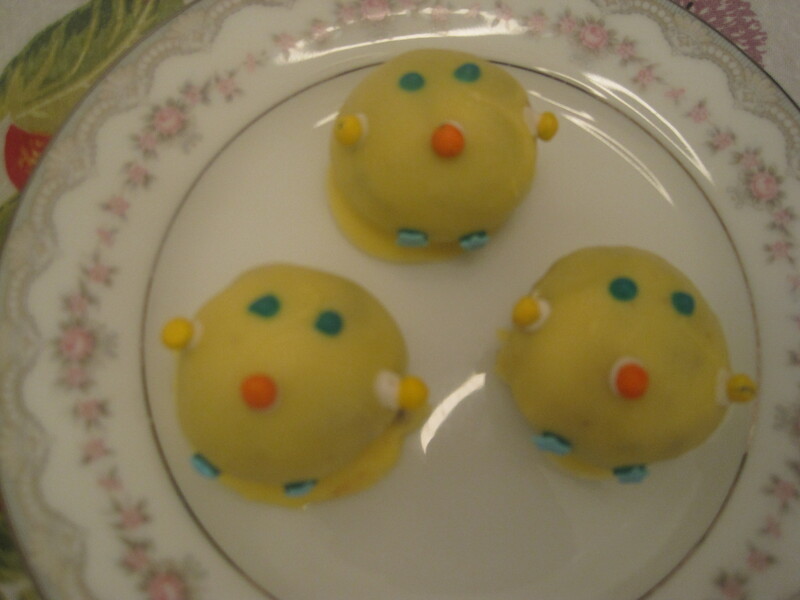 Sis’s dessert creation: cake balls. I’m not sure what the hell they’re supposed to be. Cats? Aliens? 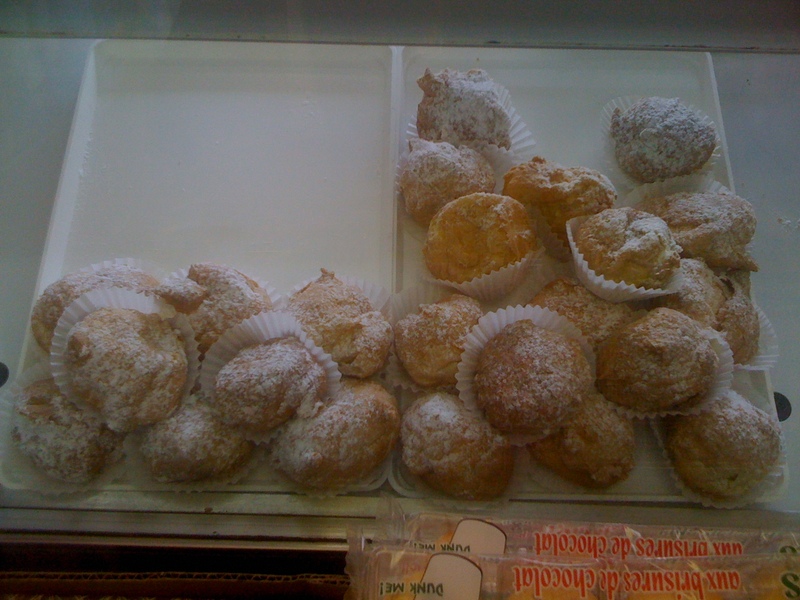 First stop: Boulangerie NDG for the Zeppole di San Giuseppe which sis claims are the best in town. 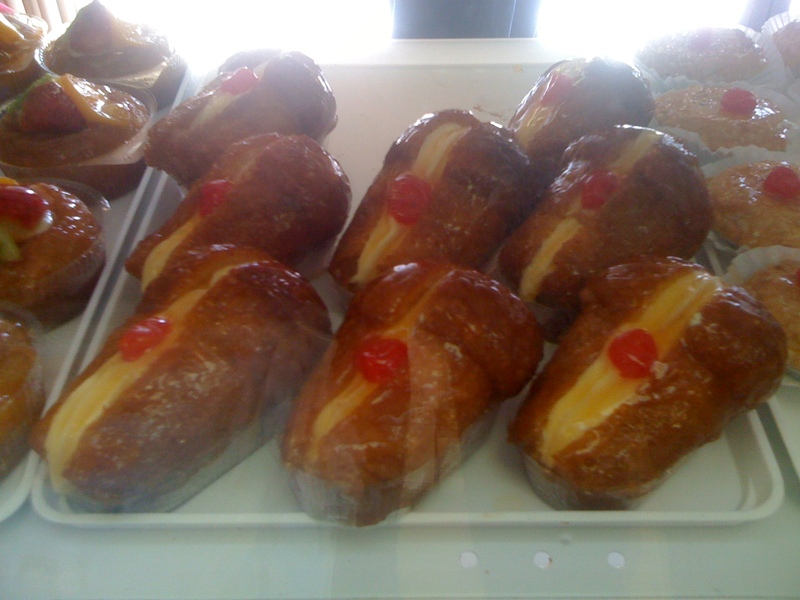 They were out of the custard filling, so we went with the ricotta and the Chantilly cream. Both wonderful although I preferred the denseness of the ricotta, while sis and Lili preferred the airy lightness of the cream. We also picked up a Baba au Rhum with custard which turned out to be a bit of disappointment given that the custard was still frozen. 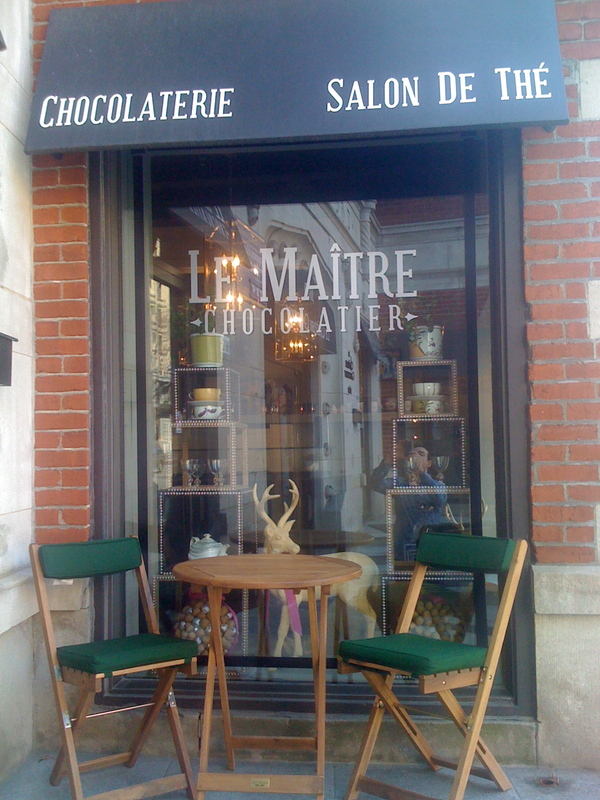 Next stop: Le Maitre Chocolatier. Nada, co-owner and chocolate expert, informed me that all of the shop’s chocolate is made using cocoa from the Concepcion plantation in Venezuela. My sister sent me an assortment last year and I fell in love with their creations, particularly their foie gras truffles! Nada assured me that she could put together an extra-special order for my next chocolate party. 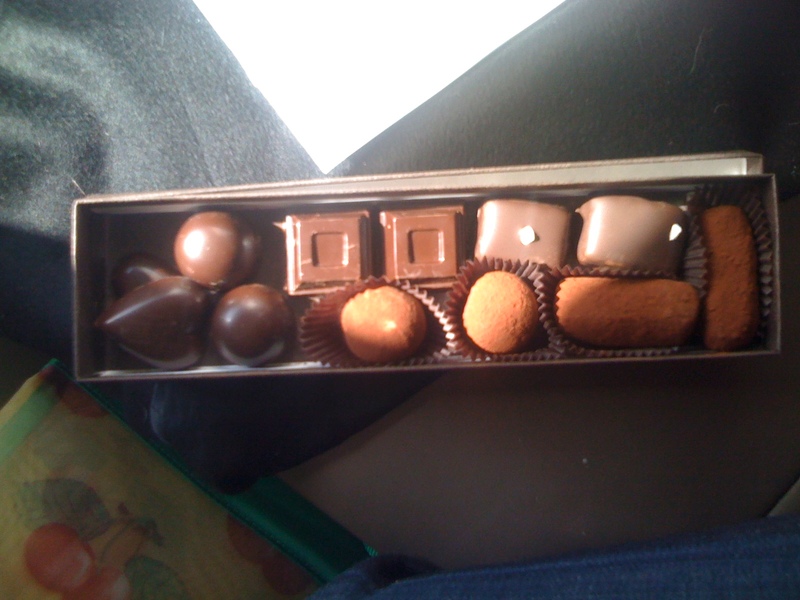 A fabulous assortment from Le Maitre Chocolatier. 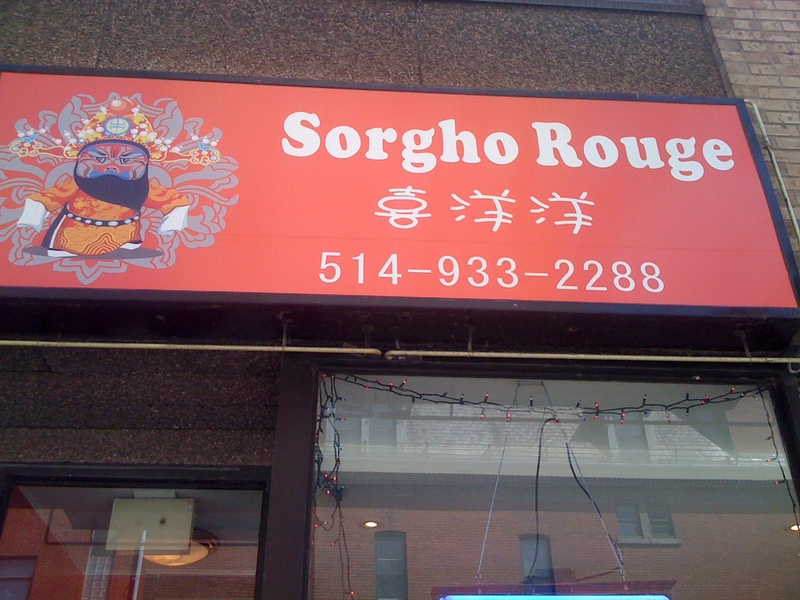 The third stop of our culinary tour was a lunch stop at Sorgho Rouge (Red Sorghum?). 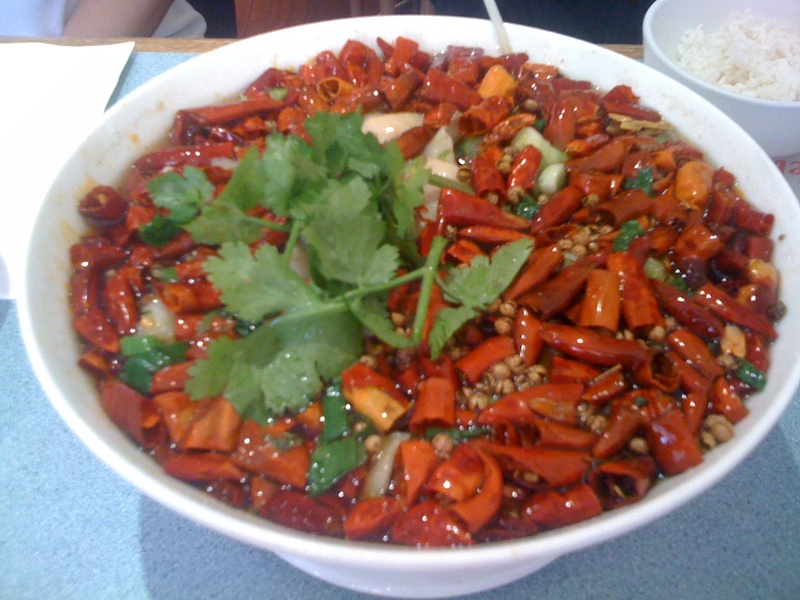 Blast your tastebuds with a bowlful of spicy chili fish! We also had some cumin lamb, yuhsiang eggplant, and dry fried green beans. 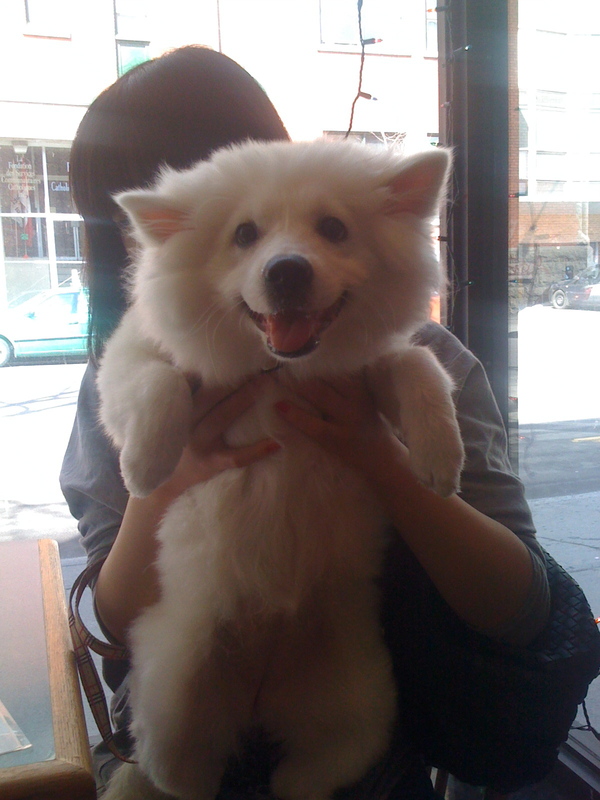 This dog also came by – presumably NOT to enjoy the chili fish. Stop #4: Polish Patisserie Wawel for their famed home made doughnuts. I went with the custard and the plum. Both good but not something I’d make a point of going back for. 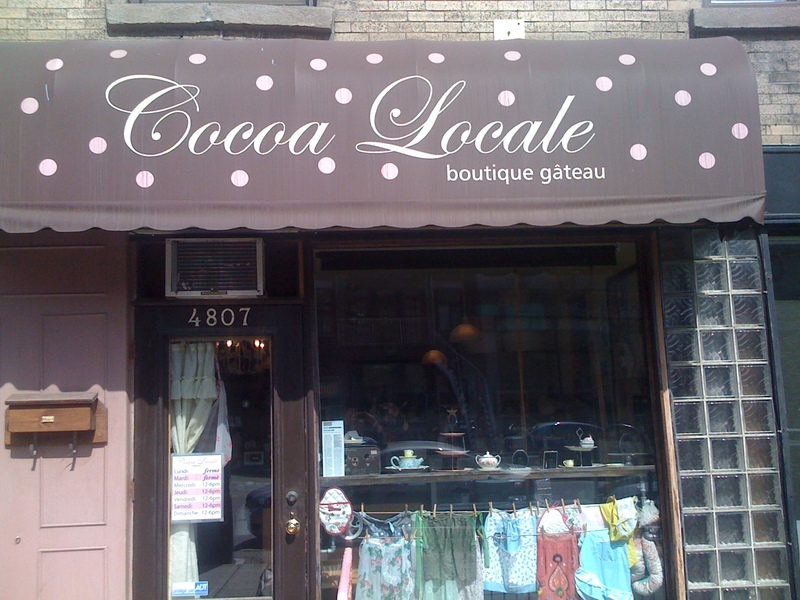 Next up, our fifth stop on the tour: Cocoa Locale, Cake Boutique. 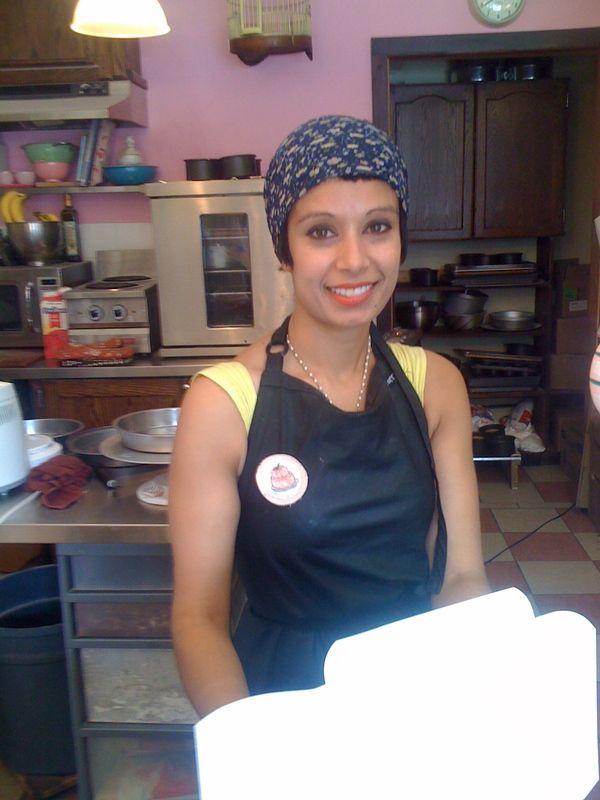 Owner Reema Singh has been running the shop her way for five years. And, by her way, I mean she bakes her cakes daily, works the shop alone and then, once all the cakes have been sold, closes up shop for the day. 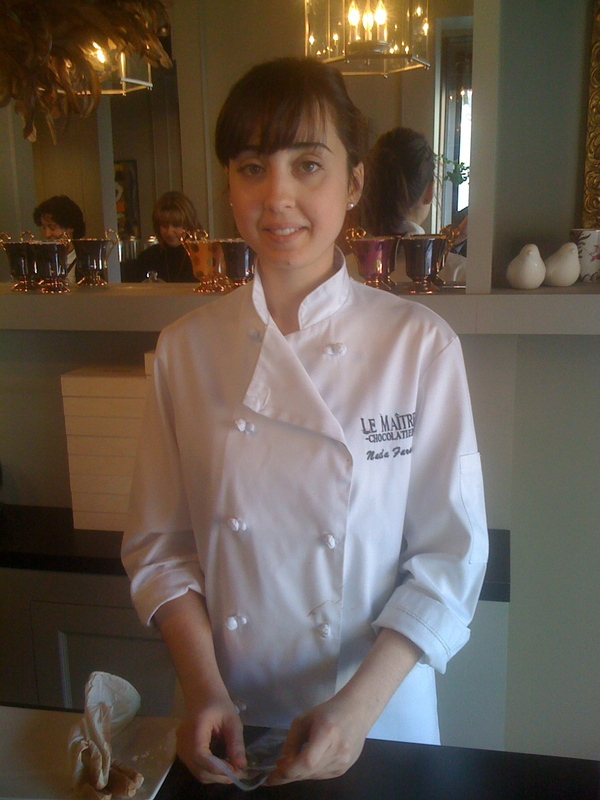 So if you’d like to check out her delicious creations, head on over to 4806 Parc – but make sure you visit earlier in the day. 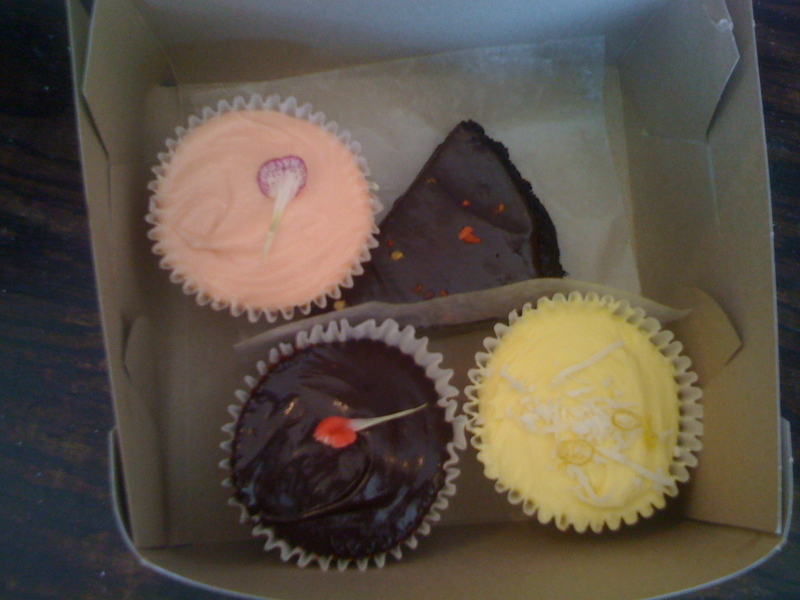 We went with an assortment of cupcakes (vanilla-rose, chocolate-chai, and lemon-coconut) and the chili-chocolate brownie. In a word = unbelievable! High recommended! 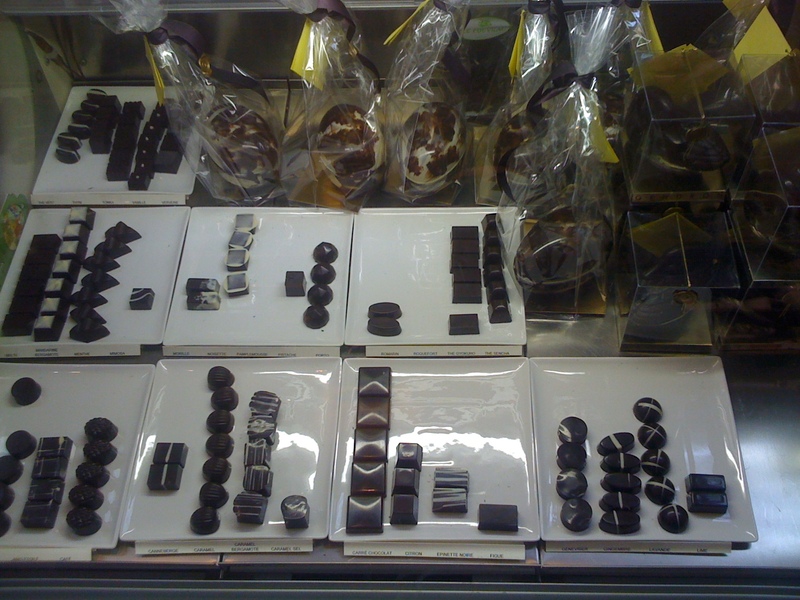 The sixth stop of our tour was the Patisserie Fous Desserts Chocolaterie where we stopped in for a chocolate assortment. The matcha-chocolate truffle was a beautiful but packed a stunningly bitter punch. 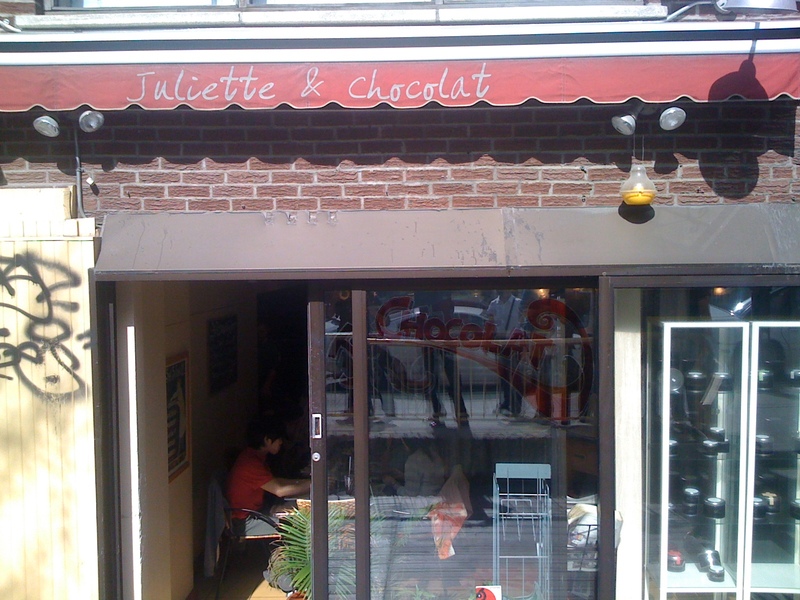 Stop #7: Juliette & Chocolat. Have you picked up on the recurring theme yet? I had a hot "old-fashioned" dark chocolate. 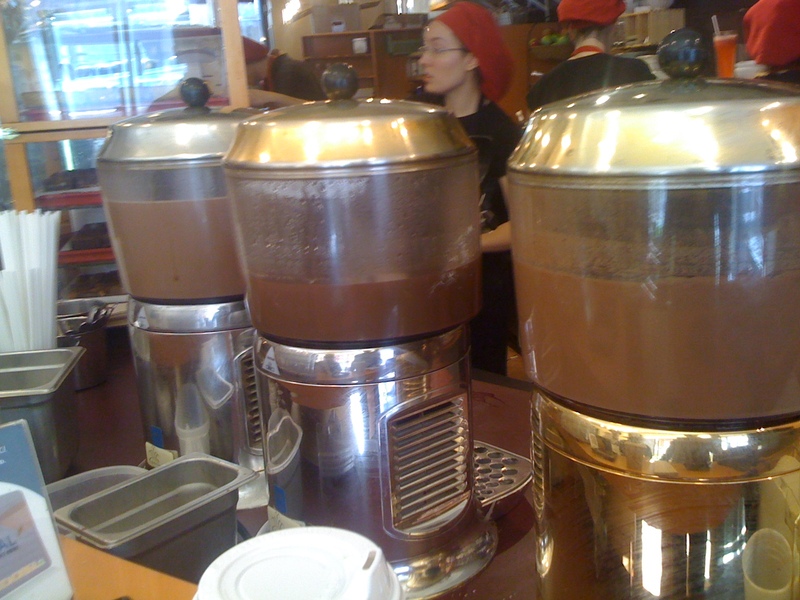 It was very good but, alas, I miss the can't-be-beat denseness of the appropriately named "Denso" Themis used to serve at Chocoatl. I miss that place. I picked up an assortment that included dark chocolate with yellow pepper, blueberry-banana, and, my favorite, the PB&J! Stop #8: Le Fouvrac. 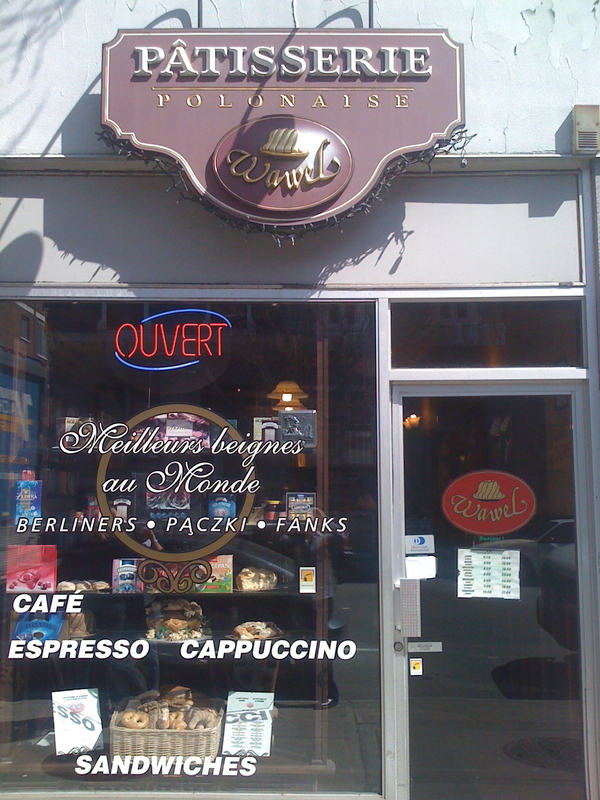 It's looked so unassuming from the outside, that I almost bypassed it but, within its modest confines lies a chocolate lover's dream cache: chocolate bars from all over the world including producers I've yet to sample. Needless to say I stocked up. 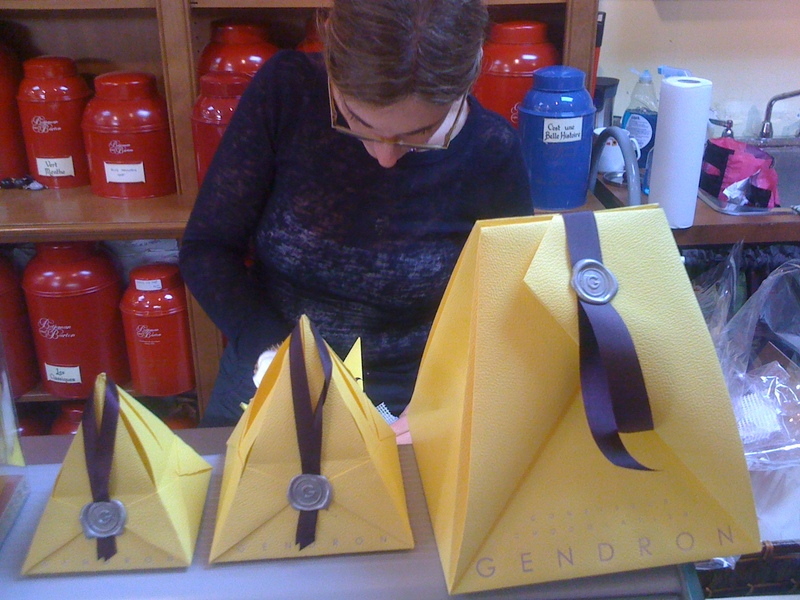 They also offer chocolates from Gendron, a local chocolatier, at their Fleury Street location. 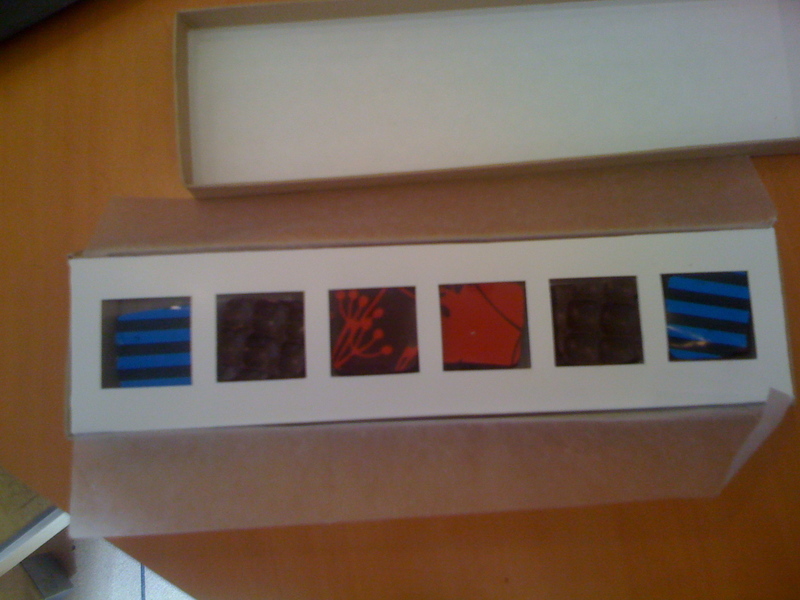 The chocolates were incredibly refined and delicate, possessed of an exceptionally thin chocolate coating. Wow! They rivaled many of the world's best. 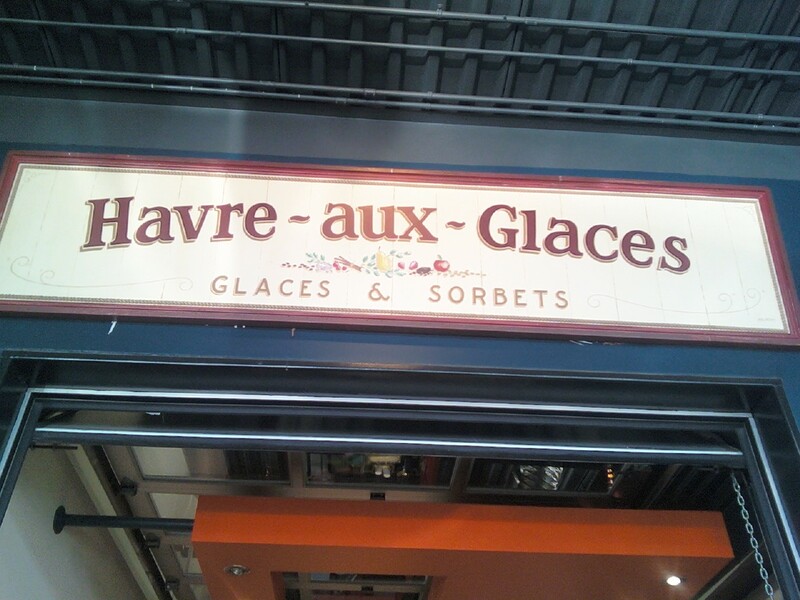 Our final stop: Havre aux Glaces at the Jean Talon Market. Where we washed down chocolate and dessert with a nice bowl of ice cream. I went double scoop: coconut and burnt caramel maple syrup. Damn good! 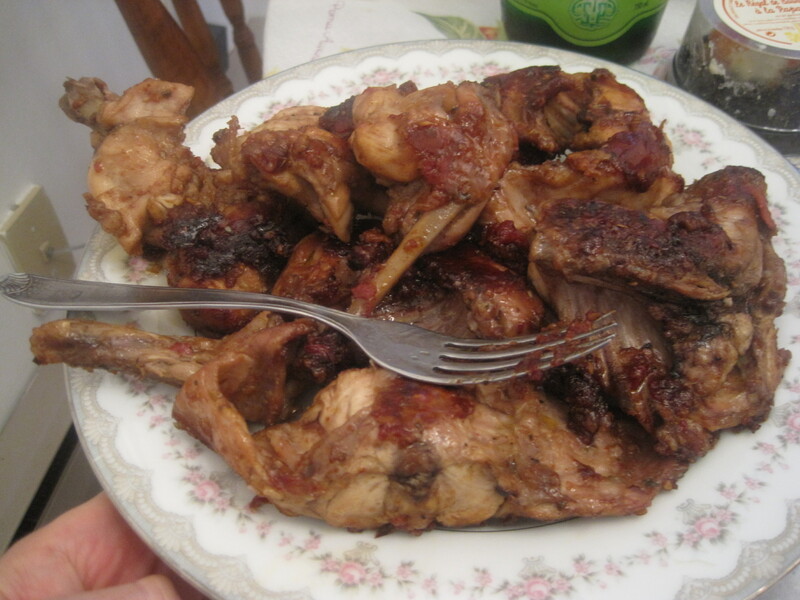 We got home for around 5:00 p.m. and, come dinner time, I was not at all hungry. Maybe I’m coming down with something? Anyway, I think I’ll take it easy tonight, watch some SyFy, and then slip quietly into a diabetic coma. Tonight’s the night! Stargate: Universe returns with Space! I’ll be checking your comments and, tomorrow, I’ll field your questions AND announce yet another big SGU guest Q&A! Previous Article April 1, 2010: Feel the Burn! Next Article April 3, 2010: Space! I gained five pounds just reading this entry. Do you just sample the desserts at each shop and purchase some for later, or eat an entire dessert at each? And if the latter, how much time between each stop? It all sounds and looks delicious to this chocolate lover. Not a fan of that cover art. Seriously — “…and others”? What are you, chopped liver? The food looks fantastic! Love your Sis’s cake balls! My culinary experience was a lot less grand but I think I got just as full. We went to a BBQ place in Memphis, “Leonard’s”. 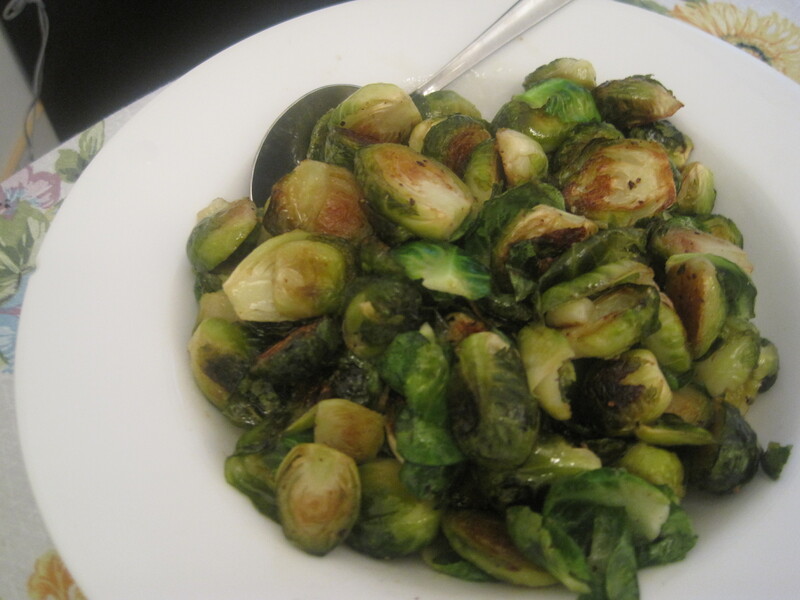 I went off my veggie only diet, just for today. Cole Slaw, BBQ pork, steak fried potatoes, peach pie, and chocolate cake. I had only ONE serving of BBQ, so I could have room for two desserts. Totally worth it, too. Your mom looks good. I hope she doesn’t try to over work while you visit. I’m sure she is happy that her “baby” is back home. p.s. forgot to add but cover art looks very cool! The desserts look fantastic!! Makes me want to visit at some point. Counting down the hours until Space!!!!!! I’ve been excited all day!!! Congratulations on releasing the cover art. I can only imagine it must be exciting to get the go ahead to release the art on work that’s about to go public. I’ll get to know for myself how it feels soon … I hope. ok wow wait,,,is it Friday April 2 ? Somehow I missed Mar 31st’s post, how did I miss those cute baby pics??? And wow the early post threw me. I like when you’re on the east coast Joe, the posts are early. Hey it’s finally in the 80’s here, we’re just down the coast…. c’mon down. 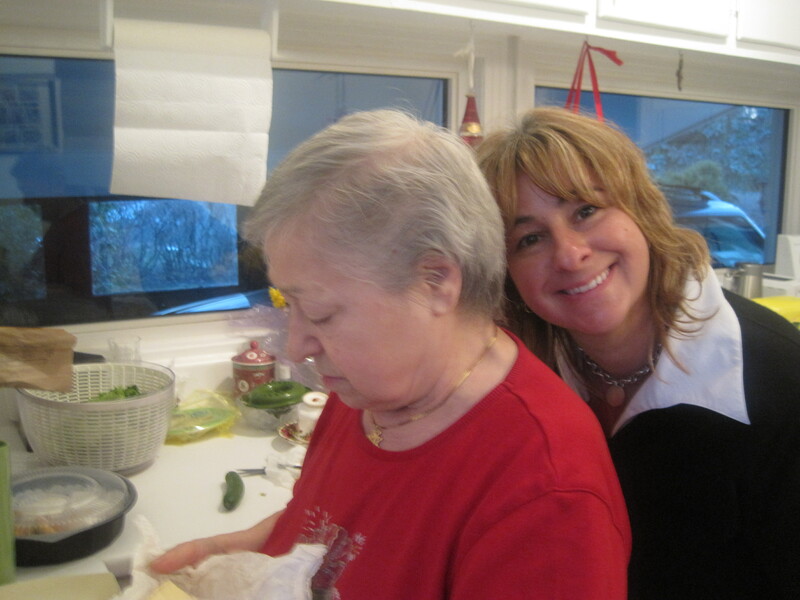 Bring mom and sis -mom looks great,please give her a big hug. I think sis deserves a vac too. Well,being Good Friday, I expected the morning to be busy but the afternoon slow, since many doctor’s offices would be closing for Good Friday. I was getting phone calls from people who were on VACATION booking cases. Who does that??? I wasn’t impressed. I swear they did it just to annoy the crap out of me. ok a little vanilla Stohli and coke and that’ll get the kinks out. Does our new health care cover rehab? I think I’m gonna need it. I agree. “and others” is totally not your name. I’ll be looking to buy that when it comes out. How on earth do you maintain your weight after a day like that? Guys have it so much easier sometimes. I’d have gained five pounds just by looking at each of the stores. It does look like you’ve gotten a great assortment. Sis looks adorable, mom looks great (and very preoccupied), and Felix is as handsome as ever! Have a great time, sir! Wow!!! Those desserts look GREAT!!! I agree that I think I gained a few pounds by reading this entry. The family looks great! I am glad to see your mom up and around. Can’t wait for Space tonight. Should be good. Can’t wait to see if (how) Rush gets off he planet, what happened to Franklin in the chair? Good. Stuff. How does the fact that Col Young told Dr Rush, that the kino kept recording so he (col Young) knew that Rush was behind the gun being in his quarters, affects dr Rush and Eli relationship going forward? there is so much to look forward to. Nice cover! Though, I’m with Carl; “And others…”? You’re so much more than just “others”! I’d say you’re at least a “more” or better yet, “much more”. I mean, you’re definitely better than “so on”, that’s for sure. “Space” just started on the East Coast! Time to get off the Internet for an hour to avoid spoilerage! I’ll return with my wild ravings in 2 hours! Thats why the kinos were being used to lead up to this, awesome!!! ACK! Almost missed Universe! Thought it came on at ten. Fortunately, I forgot to set it up to record, but – fortunately – had it set on the channel, so I just had to rewind. Whew! And that’s gone down a little. Anyhoo…got home, finished up the bills, ran to the bank and post office, then to the office-office to work, and just got home at 9 pm, and FINALLY eating my hoagie meant for lunch, for dinner. With wine. Lots of wine. Gotta go rewind the show now…did see the alien and it looked HAWT!! (Kidding…kidding…) It does look pretty cool, though. Looking forward to this one, Joe! AAARRRGH! That first ‘fortunately’ was supposed to go bye-bye when I edited. Grrrr. Blame it on the day I’ve been having. Your sister is really cute. I mean really cute. Is she single? Only half way through, and holy cow!!! That’s a great twist! can’t wait 20 mins for the end!!! Love all the pictures Joe, thanks, Moms cooking, yummy. man did you have choc overload or what. my head hurts, hard to make choices and eat just one, thats what you did right, only one small taste..
Argh! damn, the cable just went out in the middle of SGU, crappy cable company, will try to catch it on the 11pm run. so am ignoring if any spoilers,,. Young is trying to hide his crime by having them destroy the alien ship. Young is done. Perhaps I am being a bit crass here, but F* the naysayers. That was a great episode! I was definitely entertained. Look forward to more episodes like this. My hatred for Col. Young has yet to subside. Having thrown my lot in with the Rush camp, I’m not sure it ever will. Wow Rush is covering for him. Or is this really Rush and Chloe? Wow!!! Loved that episode! Never saw the twist w/ Rush! Action, interesting use of the stones, that was everything we wanted! Throw in a mutiny, the only thing missing is what happened to Franklin. Great job. Keep it up.